I recently found myself at a chaotic Manhattan rooftop during happy hour when something caught my eye. I watched the setting sun illuminate a 20-something’s cocktail. He sat back totally relaxed, unaffected by all the shot-taking and selfie-snapping around him. That fizzy, orange drink brought out his innermost chill. My friends and I were so mesmerized that we ended up ordering a couple rounds of the cocktail ourselves. It was then I learned that it’s not just that an Aperol Spritz tastes good -- though it is just the right combination of bitter and bubbly -- it’s how an Aperol Spritz makes you feel: like you’re destined for a life of leisure. Or more specifically, like you want to empty your retirement fund and spend it on an Italian villa. Which makes sense, because that’s where it all began: Padua, Northern Italy. In 1919, the Barbieri brothers introduced Aperol -- the bitter, orange liqueur -- to the world, making this now-iconic drink possible. But the elements of the Aperol Spritz (Aperol, Prosecco, soda) lived independently for decades before joining forces. Here’s a brief history of how it all came together -- and why the spritz remains to this day the perfect cocktail to toast summer. Let’s start with the all-important spritz factor. Carbonated water was first successfully bottled centuries before the Aperol Spritz debuted, in a process developed by Jacob Schweppe in 1783. 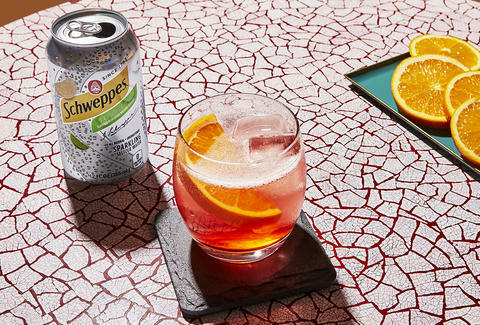 His success was devising the first bottle of its kind to retain carbonation and 235 years later, a bottle of Schweppes is a great go-to for adding crisp, refined bubbles to your Aperol Spritz. Of course, there are a lot more flavors now than in those days... but more on that later. It wasn’t until the 1920s that someone had the ingenious idea to add the almighty bitter element, aka aperitif liqueur. And while spritzes can be made with anything from Campari to Cynar to Vermouth, it’s the Aperol Spritz that stands the test of time. In Italy, the Aperol Spritz is not merely a drink, but rather a way of life. According to Talia Baiocchi, who co-authored Spritz: Italy’s Most Iconic Aperitivo Cocktail, with Recipes with Leslie Pariseau, this cocktail was born as a “statement of identity and an exploration of the Italian psyche” during the Fascist era. She says that Futurism -- an artistic cultural movement with emphasis on patriotism -- led Italians to create these cocktails as statements of their values. 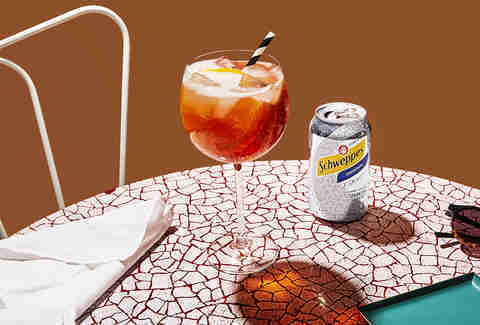 And though we’re far gone from that period, the Aperol Spritz still represents the same Italian principles: “It’s this all-important sort of transition from work to play in Italian culture, and the importance of unwinding -- taking yourself from one part of your day to the next,” says Baiocchi. That might explain one reason for the bubbly beverage’s resurgence. This “Spritz Life,” as Aperol calls it, is about drinking often and drinking well -- but not necessarily hard. The aperitivo liqueur is only 11% ABV. Prosecco is about the same. Compared to something like Campari (the main ingredient in a Negroni), which has an ABV of about 24% depending on country, Aperol -- and in turn the Aperol Spritz -- is a pretty light drink. You don’t want to be one and done during long summer days. That’s where the Aperol Spritz comes in. You can enjoy every last bit of good weather… without going down before the sun does. And if you needed another reason to drink it (other than it tastes great and probably won’t have you texting everyone in your contacts), the cocktail is just plain pretty. Scroll through the #Aperolspritz hashtag on Instagram and close to 700k images pop up. The orange color complements nearly any summer palette, be it blue pools or the green of your avocado toast -- and Aperol itself has taken notice. Every other post on the amaro’s official feed is about winter being over and sunny brunch mornings. Photograph a spritz in unflattering or unnatural light and you probably shouldn’t have ordered one at all. In a time where food fusion is all around and charcoal-activated croissants are the latest thing, it shouldn’t surprise you that the Aperol Spritz has found a cohort of imitators and innovators. We’re decidedly okay with it, though -- especially when the creativity pays off in spades. Bartenders around the US are taking the revival into their own hands, offering up new takes on the classic Italian cocktail. At Bar Clacson in Los Angeles, the Clacson Spritz is a combination of Aperol, fresh lemon juice, white wine syrup -- which Baiocchi says is “pretty amazing” -- Prosecco, and soda water. Then, just when you thought the drink couldn’t get any more perfect for summer, Adam Bernbach of DC’s 2 Birds, 1 Stone came up with the blended Aperol Spritz two years ago. That’s right, it’s frozen. But it also uses orange and lime juice, vodka, and just a pinch of salt. Want to spritz-it-yourself? Psh, of course you do. To put a spin on the original, this recipe from Schweppes couldn’t be easier. It’s simply 1-1-1. Start with a glass of ice, then pour one part Aperol (2 oz. ), one part Prosecco (2 oz. ), one part Schweppes Lemon Lime Sparkling Water, and garnish with an orange slice. 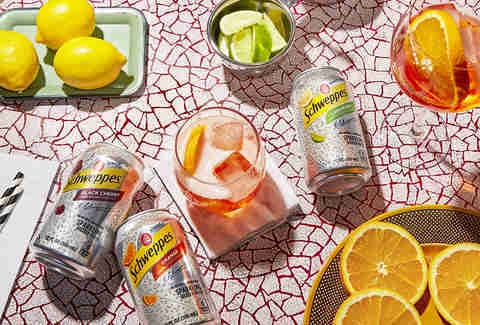 As an alternate, try Schweppes Raspberry Lime or Schweppes Orange -- or really any of their sparkling water flavors. Since there’s room to experiment, you kind of can’t go wrong. “It’s a drink that can essentially be shaped to your desires and whims,” says Baiocchi. And let’s say, hypothetically, you want to be in Italy. (It’s funny because who doesn’t, right?) The spritz can take you there. If you don’t believe us, sip for yourself.